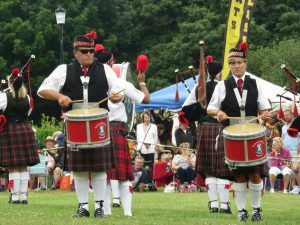 The Rose and Thistle Pipes and Drums is a Gosport and Portsmouth based band who have been entertaining the southern counties of England, especially Hampshire, for over 60 years. As the name suggests we play the Great Highland Bagpipes, the Scottish Side Drum, Tenors and Bass. We are a social band (with a serious side) who believe in playing the instruments for the enjoyment obtained as well as the pleasure we receive in performing for others. Musical content and quality are very important to us, as our competition results reflect. Under the leadership of our Pipe Major Nathan Colbern, we have grown from strength to strength and look forward to continuing this achievement in the years to follow. Glenduart Pipes and Drums are a Grade 4 band based in Hildenborough near Tonbridge in Kent, South East of England. This local Pipe Band supports many carnivals and events throughout the year. We have been competing for 4 years now and have progressed every year so far. We have competed in the World Pipe Band Championships twice. We have collected a few local prizes and also came 5th in the All England Championships at Chatsworth. The Hampshire Caledonian Pipe Band, is a Grade 4 (B) Band, we are seeking both Pipers and Drummers to join a friendly band of like minded individuals, who would like to play or learn to play an instrument with our band. If you want a piper, a miniature band, a pipe band for any event, we will be happy to introduce you to the right people to make your occasion spectacular and memorable. It all began in 1997 in the back room of the Bear Pub in Hotwells. Jimmie McQueen, a piper of some distinction, had not long arrived in Bristol and used this room to play his pipes. 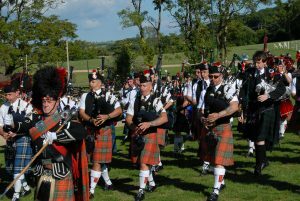 He knew several local pipers and they gathered together to play and be tutored by Pipe Major Brian McRae. Within a few years, these pipers were joined by Army Bass Drummer John Morrison and drumming tutor Tom Patterson and two exceptionally good pipers Bill Gass and Julian Smart. The City of Bristol Pipes and Drums band was officially constituted and affiliated to the Royal Scottish Pipe Band Association. The first engagement of the Band was to lead the Remembrance Day Parade in Bristol City. Reading Scottish Pipe Band are one of the biggest pipe bands in the South East of England playing in many local and international events and competitions.The Band was formed in 1957 by former pipers of the Queen’s Own Cameron Highlanders. Thus it wears the Cameron of Erracht tartan. It has an extensive repertoire of Scottish music and has played many times in France and Spain, as well as Serbia, Sardinia and Japan, including Verona and Ivrea (Italy), Valreas (France), and Bilbao (Spain). Each year the band plays at the Royal British Legion’s remembrance day parade in Bracknell with the Pipe major playing the Flowers of the Forest during the laying of the wreaths. It also supplies solo pipers for special events such as Burns Suppers, Weddings, Birthdays, Parties, Funerals and the New Year celebrations. Medina Marching Band is a military styled marching band based on the Isle of Wight in the United Kingdom. Founded in 1976 by the late George Urry. The band caters for total beginners and more experienced players alike who desire the opportunity to play a traditional musical instrument in a traditional setting. Medina Marching Band has band members with ages starting from as young as 8 years old and can even boast many entire family memberships. Medina Marching Band, now in its 42nd year has become a welcome and familiar sight at parades, shows and events the length and breadth of the country. In a world where borders and traditions are being eroded and forgotten we strive to keep the United Kingdom marching band’s identity and traditions alive. Raised in 1739 and originally numbered the 43rd Regiment, the 42nd Foot is the most senior of the Highland Regiments. The sombre appearance of its famous tartan and its original role of policing the Highlands led to it being called ” The Black Watch ” a name it bears to this day. The unit wears the uniform of the period 1812-1815. The authenticity is as near as is possible from records of the day. The 1st Battalion 42nd Highland Regiment is an organisation recreating as authentically as possible, the uniform, drill, musketry, tactics and daily life of the regiment in 1815, the year of the battle of Waterloo. We are regularly involved in battle re-enactments and living history demonstrations for the general public in Britain and abroad. Canons are often brought along for these re-enactments. A small group of Pipers with a Keyboard Player and side drummer based in Dartford with the drum corps based in Essex. The Pipe Major is Chic Mackie, keyboard player Christopher Nelson and brother Phillip is the side drummer. The keyboard and bagpipes combined, are a new twist to ‘Mini Band’ and ‘Concert Band’, which is an idea proving very popular. 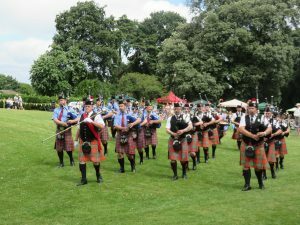 Last year (2018) the whole Pipe Band performed at the Wensleydale Show in Yorkshire and were very professional, smartly dressed and sounded really well, considering they are a fledgling band. The future looks really good and looking forward to 2019 where they are considering going into Mini- Band competition . We would like to welcome Dartford and District to the Island Highland Gathering.